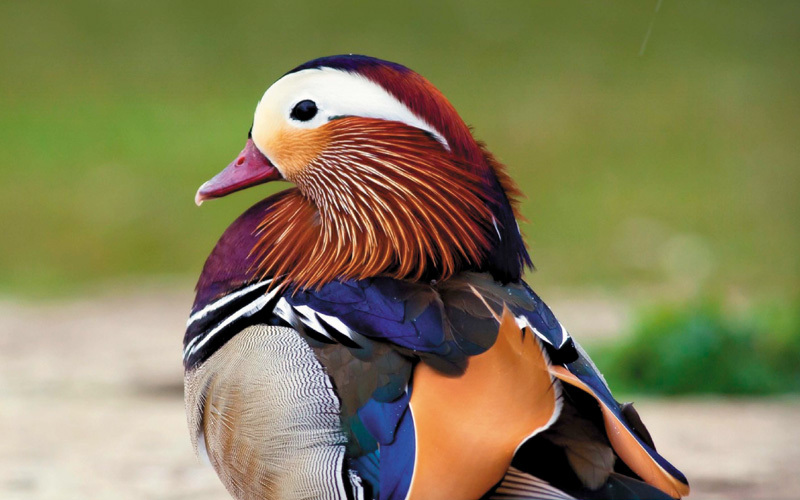 The Mandarin duck is a perching duck species found in East Asia. They are medium-sized birds about 40 to 49cm long with a 65 to 75cm wingspan and are considered to be closely related to the North American wood duck. The adult male is a striking and unmistakable bird. It has a red bill, large white crescent above the eye and reddish face and “whiskers”. The breast is purple with two vertical white bars and the flanks ruddy, with two orange “sails” at the back. The female is similar to female wood duck, with a white eye-ring and stripe running back from the eye, but is paler below, has a small white flank stripe, and a pale tip to its bill. They mainly eat plants and seeds, especially beechnuts. The species will also add snails, insects and small fish to its diet. The diet of Mandarin ducks changes seasonally; in the fall and winter, they mostly eat acorns and grains. In the spring, they mostly eat insects, snails, fish and aquatic plants. In the summer, they eat dew worms, small fish, frogs, mollusks, and small snakes.